Let's talk about some ways that you can make money off your vehicle-and no, I don't mean creative ways of selling your car. What I'm talking about are ways you can easily make money on the side, ways to multitask with your car and make the most out of your transportation device. Ready to buckle up? Lame jokes aside, let's discuss the five ways you can be thrifty with your ride. Did you know there are companies that pay you to wrap your car for advertisement? No kidding. You could make a nice passive income by doing this with your car, so long as you don't mind standing out while driving on the road. Companies like Carvertise will pay you $100 a month to advertise your choice from their selection that needs advertising in your area, sometimes even $200 a month for up to six months. They also offer $30/hour to park in specific areas. According to their site, the wrap comes off easily enough and does not damage your car, and you can even use a leased car! There are other companies that have similar needs in advertising, and just by driving around you can make some money off your car to put towards debt, save, or just a little extra in your pocket for spending. ItÕs really not a bad gig. Apps are so incredibly efficient and useful these days, and with companies like Uber and Lyft you can easily sign up to be a driver and make some cash on your own time, when you need it. There are requirements for your car to be in working order and not totally gross on the inside, but so long as you meet those requirements, you can start a pretty easy side job that has all hours available for you to profit off of, especially if you live in a city. Just to break it down a bit more, Lyft in particular offers automatic auto insurance as you become a commercial driver, though I do stress taking a look on the fine print with that to see where gaps in that coverage lie. You get paid by a per minute and mile basis, plus tips, so depending on how frequently you commit to this job will determine just how much money you make off your car. Similar to Lyft and Uber, you can make money off of using your car for delivering not just people, but products too! Amazon Flex, Uber Eats, DoorDash, etc. are all services that rely on independent drivers to deliver packages and food, which obviates the whole people interaction thing that has to happen when you're serving as a cab. You work your own hours for these services as well, which can make scheduling it around your fulltime job so much easier. You can work for all three of the mentioned companies in California regions, but any others you might want to do a little research into to see where they extend their reach. People pay an awful lot of money to get their furniture moved from one house to another, so if you have a truck that can manage it, you have the potential to make a lot of extra money by providing a moving service. This option gets a little tricky, because big companies have insurance plans for their customers and have the luxury of being well-known and responsible. Often customers will question an independent party's reliability, but if you are able to advertise yourself a little and write up a small contract, you could develop a nice side-business, especially since most people need to move on weekends due to work. 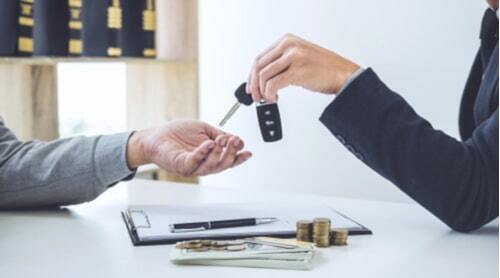 You can definitely make this a very lucrative way of making money off your car, but it does require more commitment than the previously listed options; however, it is also so far the quickest way to make much larger sums of money. You could certainly casually offer this service to those you know, including coworkers and neighbors as well as friends, but it might be easier to get a second part-time job if you arenÕt up for the bigger task. Last on our list involves title loans. First off, what is a title loan? A title loan is a loan using a vehicle title as collateral for that loan. Title loans are designed as a short-term cash flow solution and not designed as solutions for long term financial problems; however, this kind of loan does not heavily rely on credit for most lenders, and therefore can assist in mostly emergency situations such as a surprise medical bill, abnormally high rent, necessary car maintenance, etc.. You could also have the pleasure of being able to drive your car around while taking out this loan, and even potentially using it for any of the above services in order to make even more money to pay back your loan and then some. If you need money immediately and do not have the luxury of the time it would take to earn it through traditional or any of the first four's means, then this might be a viable option in order to get what you need quickly. That way, after taking care of whatever money crisis you have, you can apply any and all of these methods to get back on track with your finances. The gist of this entire article if that, if you don't already know, your car is a tool you can make work for you. Cars are certainly necessary in most places in America to even live your life, but you can utilize them in so many other ways besides personal transportationÑmaking money off your car can make a huge difference in the line between living paycheck to paycheck and balancing your books happily. So, if you are interested, take a look at what kind of car you have and then google some of these places, see if theyÕre right for you. Good luck!